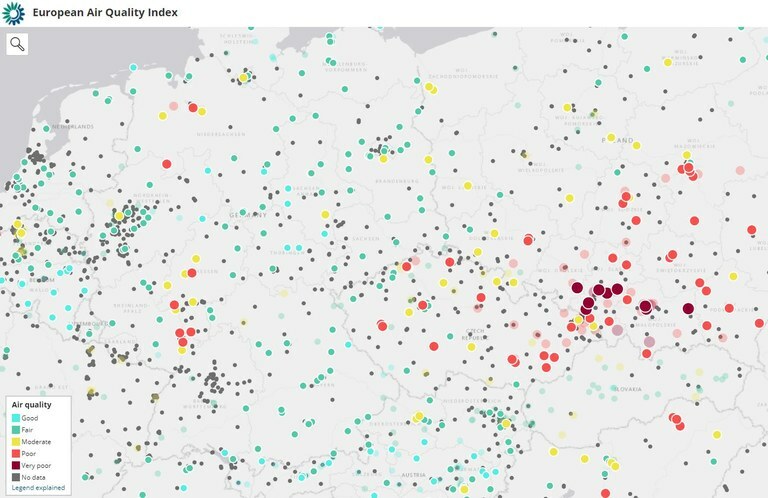 A new European Air Quality Index, launched today by the European Environment Agency (EEA) and the European Commission, allows users to check the current air quality across Europe’s cities and regions. The Index is accompanied by new country fact sheets that provide updated air quality information for EEA member countries. The EEA and the European Commission's new online service, the European Air Quality Index, provides information on the current air quality situation based on measurements from more than 2 000 air quality monitoring stations across Europe. The Index consists of an interactive map that shows the local air quality situation at station level, based on five key pollutants that harm people's health and the environment: particulate matter (PM2.5 and PM10), ground-level ozone (O3), nitrogen dioxide (NO2) and sulphur dioxide (SO2). Users can zoom in or search for any town or region in Europe to check the overall air quality and measurements per key pollutant. The Index shows an overall rating for each monitoring station, marked by a coloured dot on the map, corresponding to the worst rating for any of the five pollutants. "The new European Air Quality Index gives citizens an easy way to access information on their local air quality, which can have a direct impact on their health. This information, accessible to everyone, is an important basis for a dialogue and decisions that are needed to safeguard people's health, especially in cities," said Hans Bruyninckx, EEA Executive Director, presenting the Index today at the Clean Air Forum, organised by the European Commission, in Paris. Karmenu Vella, EU Commissioner for the Environment, Maritime Affairs and Fisheries, also welcomed the Index, saying: "Air pollution is an invisible killer, so the Air Quality Index is needed to inform European citizens on the state of the air they breathe in their own neighbourhood. We are working with cities, regions, countries and industry to tackle the sources of that pollution, which is a cocktail coming from factories, homes and fields, not only from transport. We must all work together to improve air quality." The EEA has also published updated country fact sheets that provide an annual summary of air pollution and its impacts in EEA member countries. Providing more detailed, country-level information on both air pollutant emissions and air quality, the fact sheets complement the EEA's annual Air Quality in Europe – 2017 report, published in October. The EEA's latest annual air quality report shows that most people living in Europe's cities are still exposed to levels of air pollution deemed harmful by the World Health Organization. The most harmful pollutant, fine particulate matter (PM2.5), caused the premature death of an estimated 400 000 Europeans in 2014. According to the report, air pollution has also significant economic impacts, increasing medical costs, reducing employees' productivity, and damaging soil, crops, forests, lakes and rivers. Road transport, agriculture, power plants, industry and households are the biggest emitters of air pollutants in Europe. European Union legislation sets air quality standards for both the short-term (hourly/daily) and long-term (annual). The European Air Quality Index indicates the short-term air quality situation at each of the more than 2 000 monitoring stations across Europe. The Index therefore does not reflect the long-term (annual) air quality situation, which may differ significantly. For references, please go to https://www.eea.europa.eu/highlights/european-air-quality-index-current or scan the QR code.